THIS NEW AND EXCITING OFFERING will feature our talented Red Chair musicians, those whose chairs have been sponsored by a generous donor. This combination of a recital and catered reception, will showcase individual musicians in unique programs, designed by the performers themselves. Our second Red Chair Spotlight will feature principal flutist WENDY HERBENER MEHNE (Betty Gelb Sass Chair) whose chair is generously sponsored by Steven and Karen Sass. She will be joined by pianist Diane Birr. This diverse program will include a variety of music by Schoenfield, Marais, Piazzolla, Faure, Bizet, and Bach. Tickets available at the door. Box office opens at 2:15pm on concert day. Note: This special event is separate from our subscription Chamber Music Series. Season subscribers receive 10% off your ticket(s) to each Red Chair Spotlight event! Contact our office to receive your subscriber discount code before purchasing your seats online. Discount will also be honored on tickets bought at the door. Wendy Herbener Mehne is professor of flute at Ithaca College where she was a 1995-96 Dana Teaching Fellow and the 2004 London Sabbatical Scholar. She is a member of the Cohen/Mehne Duo, a flute and guitar duo that is one of the School of Music’s faculty ensembles, and principal flutist with the Cayuga Chamber Orchestra. 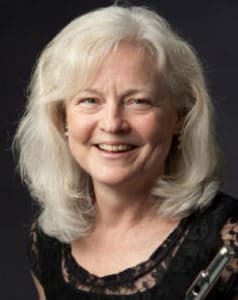 With Pulitzer prize-winning composer, Steven Stucky, and colleagues from Ithaca College and Cornell University, she was a founding member of the new music group, Ensemble X. . Click here to read her full bio. Diane Birr, Professor of piano, has been a faculty member at Ithaca College School of Music since 1993 where she teaches courses and lessons in collaborative piano, private piano and class piano, as well as coaches both vocal and instrumental chamber music. Dr. Birr also serves as Coordinator of the M.M. – Performance in Collaborative Piano degree, a new focus to the graduate performance degree instituted in Fall 2015. She has performed with numerous vocalists and instrumentalists in recitals and master classes throughout the United States, and in Australia, Canada, France, Scotland, Austria, and Norway. For sixteen years, Birr served on the faculty of International Workshops, a two-week music and arts festival held in locations around the world.